The treatment helped alleviate insomnia, depressive mood, and anxiety. Post traumatic stress disorder (PTSD) can wreak havoc on a person’s mental and physical health. Sufferers can experience bouts of extreme panic, anxiety, or depression, as well as problems sleeping, cardiovascular issues, and gastrointestinal disorders. Treatments for PTSD typically include a combination of antidepressants and psychotherapy, but a new outside-the-box approach could prove to be much more effective. Researchers from Wake Forest Baptist Medical Center are exploring a novel treatment that reduces patients’ PTSD symptoms by allowing them to “hear” their own brainwaves. The study has been published in the journal Military Medical Research. For their study, the team used a technology called high-resolution, relational, resonance-based, electroencephalic mirroring (HIRREM). Sensors placed on a PTSD sufferer’s scalp read electrical signals in their brain. These signals are then fed into a computer that uses specially designed algorithms to “translate” the signals into auditory frequencies. 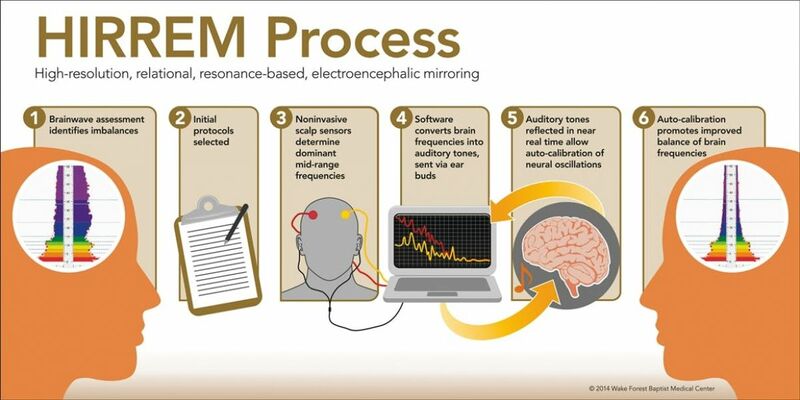 When these frequencies are played back in near-real-time, the patient is able to actually hear their own brain waves. Allowing patients to listen to their own brain activity isn’t merely a cool trick, though. According to the Wake team, when the patient is listening, the brain understands that it is hearing its own oscillations, and if what it is hearing is too erratic (a symptom of PTSD), it will make the changes necessary to “self-optimize” into a more balanced pattern. Eighteen patients, all of whom were veterans or actively in the military and had been experiencing PTSD symptoms for between one and 25 years, participated in the study. The team administered the treatment over the course of 12 days, with patients undergoing up to 20 total HIRREM sessions during the duration of the study. The results of the treatment were quite promising. As Charles H. Tegeler, principal investigator on the study, noted in a news release, the treatment led to a decrease in many post-traumatic symptoms, including insomnia, depressive mood, and anxiety. The researchers also reported improvement in heart rate variability and baroreflex sensitivity (physiological responses to stress). No other intervention for service members or veterans currently experiencing PTSD symptoms has been able to make that claim. The benefits of the treatment weren’t short-lived, either. They lasted for at least six months after the sessions, according to Tegeler. While PTSD is particularly common amongst military personnel, it can affect anyone who has experienced a traumatic event, from domestic abuse to a car accident. In the United States, 20 percent of adults who experience a traumatic event eventually develop PTSD. An estimated 13 million Americans are suffering from PTSD at any given time, and one out of every 10 women in the nation eventually will develop the disorder. Clearly, a great number of people could benefit from a more effective PTSD treatment, but while the results of the Wake Forest researchers’ study are remarkable, they are merely a jumping-off point. The sample group was small, and the placebo effect may have played a role in the treatment’s success. Though the HIRREM treatment is by no means fully actualized, with further research, it could prove to be an ideal alternative treatment option for many PTSD sufferers. Unlike traditional methods for combatting the effects of PTSD, such as antidepressant medications, it doesn’t appear to have any negative side effects. Additionally, it is the first technique that seems capable of alleviating the physical complications and symptoms of PTSD. While this treatment is just in its nascent stages, it could evolve into a much-needed solution for the problem of PTSD.